The white lab coat most of us associate with our gently patronizing doctors may be on the way out. 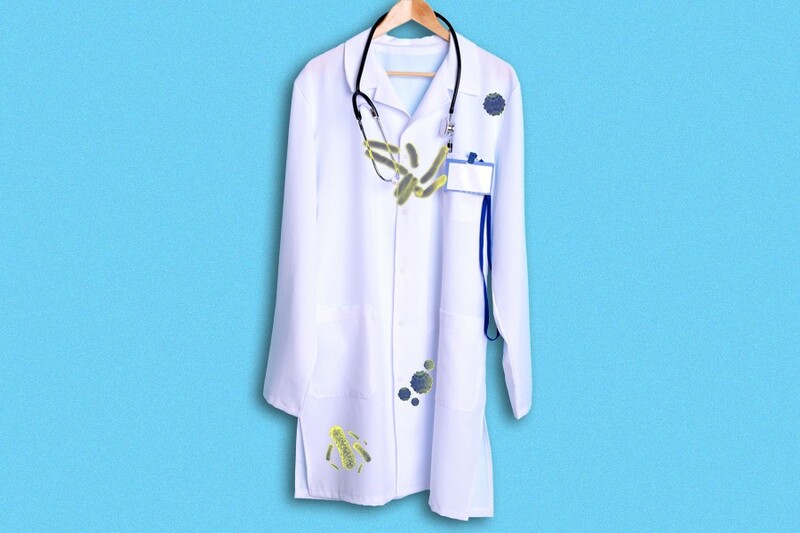 A recent study from the University of Texas found that although the physicians’ white coat is one of the most iconic symbols of the trade — something many doctors wear simply as a token of reassurance for their patients — wearing it doesn’t have much of an impact on patient satisfaction. But it’s not just the fact they’re essentially irrelevant that’s causing many in the medical community to call for their retirement: There’s also the fact that many of them could be carrying antibiotic-resistant staphylococcus aureus (staph infection). “Prior studies have evaluated the presence of antibiotic-resistant pathogens/bacterias in the white coat, which could cause severe infections in patients,” La Rosa tells me. “One study showed that one out of every five had a staphylococcus aureus in their white coat. Of those, 20 percent were resistant to methicillin. This bacteria grew even in the group that was using this white coat for less than three days.” Because of this, La Rosa and his colleagues decided to stop wearing white coats during postpartum rounds. But it’s not only doctors who work in obstetrics and gynecology that are hanging up their white lab coats. Phillip Lederer, an infectious disease expert and vocal critic of doctors wearing white lab coats during patient visits, also stopped wearing his lab coat after med school. “You wouldn’t want to be cared for by a doctor who doesn’t wash his or her hands. You wouldn’t want to be operated on with instruments that weren’t sterilized or stay in a hospital room that wasn’t cleaned regularly. Why would you want to be treated by a doctor wearing a white coat that hasn’t been washed in a week? Many white coats are covered in bacteria like MRSA — they are dirty. And it’s time to hang them up for good,” writes Lederer in his article for The Conversation. His conviction is backed by yet another study from 2012 that found that although most of the white coats had been washed within the past two weeks, the sides of the coats were the most highly contaminated areas, followed closely by the collar and pockets. “Thus, a yearly purchase of white coats and the possession of two or more white coats at any point in time should be made compulsory,” write the study’s authors. But according to La Rosa, while washing the white coats at home is an acceptable alternative to reduce the viable count of staphylococcus, if combined with time-consuming tumble drying or ironing, it’s not a sustainable solution. “The problem is that this bacteria is highly prevalent in hospitals and the white coat cannot be washed after each patient evaluation,” he tells me. This is especially true when you consider that on average, E.R. doctors see roughly 18 patients every day. “I see around 20 patients daily and I change my white coat twice weekly or more if it gets stained,” a doctor at Cedars Sinai hospital in L.A., who wishes to remain anonymous, tells me. And while she agrees that a doctor’s white lab coat can become infested with bacteria, she also says it depends on the types of encounters a physician might have with their patients. “We all wear separate disposable yellow gowns and gloves when examining wounds or bleeding situations,” she adds. So why bother with lab coats at all? Board-certified urologist Jamin Brahmbhatt says that he has a closet full of lab coats, but that he only wears them if he’s getting his picture taken. “I rarely wear them outside of photoshoots because I’m constantly in and out of the OR for procedures,” he says. “So I’m wearing scrubs, and those get changed from procedure to procedure.” Instead, Brahmbhatt wears a buttoned-down shirt while visiting most of his patients. “Nowadays, you don’t need to wear a white lab coat because your name and credentials are on the badge,” he says. Additionally, Brahmbhatt tells me that there are so many people in a hospital wearing white coats that aren’t doctors, it’s no longer a differentiating factor. As for whether or not that includes a resistance against staph infection, the customer representative was unable to say. La Rosa, however, is absolutely sure it does not.